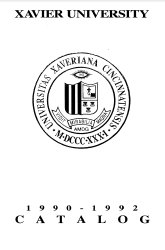 The Xavier University Undergraduate and Graduate Catalog is the official source of the university's academic programs, policies, and procedures. It is published annually by the Office of the Registrar, 129 Alter Hall. The 2010-2011 edition includes academic and programmatic requirements for students entering the university during the summer 2010, fall 2010, and spring 2011 semesters.